Awesome dive site with four different types of reef in one. First on the east side we have a boulder slope ideal for giant morays and large groupers to rest. 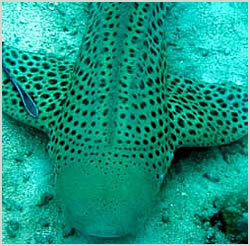 This area sweeps down to over 40m, leopard sharks and eagle rays have been observed roaming the deeper parts of the reef. Next is an area of sponges, big barrel sponges, rocks encrusted with sponge, all of this providing food for angel fish and the like. Big scorpion fish blend in well here and some very colouful specimens can be found for photography. A large sandy area litterd with small coral bommies to the southeast side can be used to find large healthy conch, pipefish and many other odd species. The final area is in the center, giant granite pinacles rise up to 2m from the suface. Resembling Stonehenge in the U.K., the upright slabs of rock play host to schools of damsel fish, basslets of many colours and a legion of other small reef fish, we also see large healthy table corals, staghorn and many other types of hard corals. Also due to the sometimes strong current we find good dense growth of soft tree coral. Some currents can be utilised for part drift dive. Consult dive operators for more information on best times to dive.